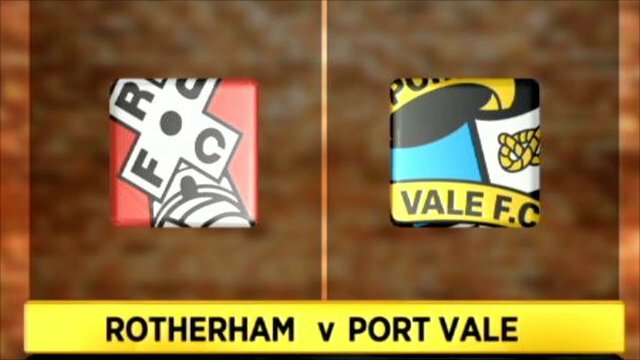 Rotherham hammered 10-man Port Vale to leapfrog them into the League Two automatic promotion places. Nicky Law shot home from close range after a fine move and Danny Coid teed up Ryan Taylor who headed the second. Will Atkinson flicked in the third after a good run, Taylor hit an acrobatic fourth and Mark Randall's fierce 25-yard shot sealed the win. Vale, who earlier this week lost manager Micky Adams to Sheffield United, have now lost three successive matches without scoring a goal and drop out of the automatic promotion places. Rotherham's biggest win of the season sees them move above the visitors into second place, four points behind leaders Chesterfield. "It was fantastic I thought. Port Vale opened up and looked really bright until we scored. "I couldn't ask for much more really. We carried on from where left off against Aldershot. "Today I just thought some of the football was excellent, the movement was brilliant and the finishing was there." 90:00+2:06 The referee brings the game to a close. 90:00+0:58 Unfair challenge on Marcus Marshall by Kris Taylor results in a free kick. Marcus Marshall takes the free kick. 90:00+0:58 Booking Kris Taylor is cautioned by the ref for unsporting behaviour. 88:51 Sean Rigg has an effort at goal from long distance that misses to the right of the target. 86:01 Marc Richards takes a shot. Andy Warrington makes a save. 84:53 Free kick awarded for a foul by Tom Pope on Adam Yates. Adam Yates restarts play with the free kick. 84:53 Booking Booking for Tom Pope for unsporting behaviour. 84:04 Kris Taylor concedes a free kick for a foul on Jason Taylor. Assist by Jason Taylor. 84:04 GOAL - Mark Randall:Rotherham 5 - 0 Port Vale Mark Randall finds the back of the net with a goal from outside the area to the top left corner of the goal. Rotherham 5-0 Port Vale. 82:48 Booking Louis Dodds is booked. 81:20 Inswinging corner taken by Tom Newey. 80:33 Unfair challenge on Ryan Taylor by Lee Collins results in a free kick. Jason Taylor takes the free kick. 80:33 Substitution Doug Loft leaves the field to be replaced by Sean Rigg. 79:40 Doug Loft takes a shot. Save by Andy Warrington. 77:43 The official flags Tom Pope offside. Chris Martin restarts play with the free kick. 77:00 Free kick awarded for a foul by Lee Collins on Ryan Taylor. Jason Taylor restarts play with the free kick. 77:00 Booking Lee Collins booked. 75:10 Foul by Nick Fenton on Marc Richards, free kick awarded. Gary Roberts restarts play with the free kick. 74:01 Will Atkinson fouled by Adam Yates, the ref awards a free kick. Will Atkinson takes the direct free kick. 72:16 Substitution Tom Pope is brought on as a substitute for Adam Le Fondre. 72:06 Ryan Taylor produces a left-footed shot from just outside the area that goes harmlessly over the target. 71:20 Free kick awarded for an unfair challenge on Anthony Griffith by Mark Randall. Free kick crossed left-footed by Doug Loft, Nick Fenton makes a clearance. 69:36 Short corner taken by Tom Newey. 67:56 GOAL - Ryan Taylor:Rotherham 4 - 0 Port Vale Ryan Taylor grabs a goal from just inside the area to the top left corner of the goal. Rotherham 4-0 Port Vale. 67:10 Marcus Marshall crosses the ball, Headed effort from deep inside the area by Adam Le Fondre misses to the left of the goal. 63:40 Substitution Mark Randall replaces Nicky Law. 63:22 Effort on goal by Marcus Marshall from outside the box goes harmlessly over the bar. 60:31 Corner taken by Tom Newey, Kris Taylor makes a clearance. 59:53 Louis Dodds takes a shot. Comfortable save by Andy Warrington. 54:55 Corner from the left by-line taken by Nicky Law, clearance made by Marc Richards. 53:14 Anthony Griffith concedes a free kick for a foul on Marcus Marshall. Nicky Law takes the free kick. 53:14 Substitution Kris Taylor replaces John McCombe. 53:14 Booking Gary Roberts is shown a yellow card. 49:47 Nicky Law takes a short corner. 49:27 Adam Le Fondre has an effort at goal from 18 yards. Save made by Chris Martin. 47:38 The assistant referee signals for offside against Marc Richards. Andy Warrington takes the indirect free kick. 47:19 Corner taken right-footed by Gary Roberts, save by Andy Warrington. 45:31 Nicky Law provided the assist for the goal. 45:31 GOAL - Will Atkinson:Rotherham 3 - 0 Port Vale Goal scored by Will Atkinson from inside the six-yard box low into the middle of the goal. Rotherham 3-0 Port Vale. 45:02 Substitution Luke Ashworth replaces Danny Coid. 45:00+3:02 The whistle is blown to end the first half. 45:00+0:07 Outswinging corner taken left-footed by Doug Loft from the left by-line, clearance made by Ryan Taylor. 43:57 Nick Fenton is penalised for a handball. Doug Loft takes the free kick. 42:35 Shot from outside the box by Louis Dodds misses to the left of the target. 41:11 Marcus Marshall takes a shot. Save made by Adam Yates. 38:10 The ball is swung over by Lee Collins, Effort on goal by Marc Richards from just inside the penalty box goes harmlessly over the target. 31:56 Tom Newey takes a shot. Blocked by John McCombe. 31:56 Substitution Chris Martin replaces Justin Richards. 31:56 Stuart Tomlinson challenges Marcus Marshall unfairly and gives away a free kick. 31:56 Sent off Stuart Tomlinson receives a red card. 30:37 Justin Richards takes a shot. Andy Warrington makes a save. 28:03 Unfair challenge on Gary Roberts by Jason Taylor results in a free kick. Gareth Owen takes the free kick. 25:36 Foul by Gary Roberts on Will Atkinson, free kick awarded. Tom Newey takes the direct free kick. 23:07 Foul by Jason Taylor on Adam Yates, free kick awarded. Direct free kick taken by Gary Roberts. 17:58 The assist for the goal came from Marcus Marshall. 17:58 GOAL - Ryan Taylor:Rotherham 2 - 0 Port Vale Ryan Taylor grabs a headed goal from deep inside the penalty area. Rotherham 2-0 Port Vale. 17:19 Johnny Mullins fouled by Marc Richards, the ref awards a free kick. Johnny Mullins restarts play with the free kick. 15:46 Outswinging corner taken by Gary Roberts, clearance made by Nick Fenton. 12:58 Unfair challenge on Jason Taylor by Justin Richards results in a free kick. Tom Newey takes the direct free kick. 12:30 Marcus Marshall produces a drilled left-footed shot from 18 yards. Save made by Stuart Tomlinson. 9:40 Will Atkinson provided the assist for the goal. 9:40 GOAL - Nicky Law:Rotherham 1 - 0 Port Vale A goal is scored by Nicky Law from deep inside the penalty box high into the middle of the goal. Rotherham 1-0 Port Vale. 9:18 The offside flag is raised against Justin Richards. Indirect free kick taken by Andy Warrington. 7:47 Justin Richards is ruled offside. Andy Warrington takes the indirect free kick. 6:59 Corner taken left-footed by Doug Loft to the near post, clearance made by Will Atkinson. 4:26 Foul by Tom Newey on Justin Richards, free kick awarded. Direct free kick taken by Adam Yates. 3:41 Unfair challenge on Doug Loft by Danny Coid results in a free kick. Gary Roberts delivers the ball from the free kick right-footed from left wing, Will Atkinson makes a clearance. 3:22 Will Atkinson challenges Adam Yates unfairly and gives away a free kick. Gary Roberts takes the free kick. 2:53 Nick Fenton concedes a free kick for a foul on Justin Richards. Stuart Tomlinson takes the direct free kick. 2:04 John McCombe gives away a free kick for an unfair challenge on Adam Le Fondre. Free kick taken by Jason Taylor.